Joint solution now meets standardization in facial image capturing systems. “FIPS201 ensures full interoperability and compliance with existing as well as future PIV systems by putting stringent performance requirements on cameras.” stated Dany Longval, Director of Product Management at Lumenera Corporation. Lumenera Corporation, http://www.lumenera.com, a leading manufacturer and developer of high performance digital cameras and custom imaging solutions for scientific, industrial and surveillance markets, in partnership with Tamron Inc., an established lens and optical component manufacturer, are pleased to announce the award of Federal Information Processing Standard Publication 201 (FIPS201) certification for Lumenera’s Lu375C camera equipped with Tamron’s M12VM412 CCTV lens. The joint solution now meets United States federal government standards specifying Personal Identity Verification (PIV)] requirements in facial image capturing systems. FIPS 201 is a United States federal government standard that specifies PIV requirements for federal employees and contractors. Since its introduction, FIPS201 led to the standardization of biometric processing for electronic credentials used for logical and physical access control systems. The Lu375C is a USB 2.0, 3.1 megapixel color camera designed for use in a variety of industrial and security applications requiring high resolution at a modest cost. Uncompressed images in live streaming video and still image captures are provided across a USB 2.0 digital interface. 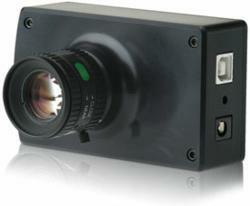 With 2048 x 1536 resolution and on-board processing this camera delivers outstanding image quality and value. The Tamron M12VM412 CCTV Lens, with a focal length of 4-12 mm, delivers high quality imagery and is well suited for cameras with a ½” imager size such as Lumenera’s Lu375. An aperture range of f/1.4-close allows for clear images in low light conditions. The CCTV lens has hybrid aspherical elements that reduce various optical aberrations, delivering high optical quality. It features manual iris, focus and zoom with lock, a focus range of 0.3m and in air back focus of 9.05mm (wide) to 18.90mm (tele). A multi-coating on the lens surface lessens ghosting and flare in backlit conditions. The joint solution is now available. For more information on Lumenera’s imaging solutions visit lumenera.com and tamron.com for details on Tamron’s optical components. Lumenera Corporation, a division of Roper Industries, and headquartered in Ottawa, Canada, is a leading developer and manufacturer of high performance digital cameras and custom imaging solutions. Lumenera cameras are used worldwide in a diverse range of industrial, scientific and security applications. Lumenera solutions provide unique combinations of speed, resolution and sensitivity in order to satisfy the most demanding digital imaging requirements. Lumenera customers achieve the benefit of superior price to performance ratios and faster time to market with the company's commitment to high quality, cost effective product solutions. For further information about Lumenera, please visit http://www.lumenera.com or call 613-736-4077. To receive Lumenera press releases as they are issued, contact us at marketing(at)lumenera(dot)com.